(3) Minutes of Supreme Council Meeting, Feb. 13, 1971, Davenport, Iowa (cont'd) Article VII, Section IX (c) (Reimbursement of State Director for National Convention Expenses). Note: at the Supreme Council meeting in Des Moines the assembly passed a motion that the outgoing State Director would be reimbursed for expenses incurred......At the meeting of Feb 13, Henry Vargas Council 10 stated that this problem had arisen and discussed before at great length. State Director Rocha reminded the members that the incoming has no official capacity other than a delegate at a National Convention because he is not sworn in until after the Convention. He further stated that he tried to register as the State Director for Iowa at the 1970 Convention and was advised he must register as a delegate from his council. At this time State Director Rocha asked Mrs. Ann Vasquez, Indiana Lulac member who has served on numerous credentials committees at National Conventions for her comment. She confirmed that the outgoing State Director is recognized at National Conventions and he is the party responsible for reports of his State. She further stated that there are times when a State Director is unable to attend a National Convention but regardless it is the outgoing State Director who speaks for his State or delegates someone to do so. Bill Rocha advised the assembly that a decision was not likely at this meeting and upon motion duly made by Jim Briseno, Council 306 and seconded by Henry Vargas it was agreed to table this subject and approve or disapprove at the State Convention. 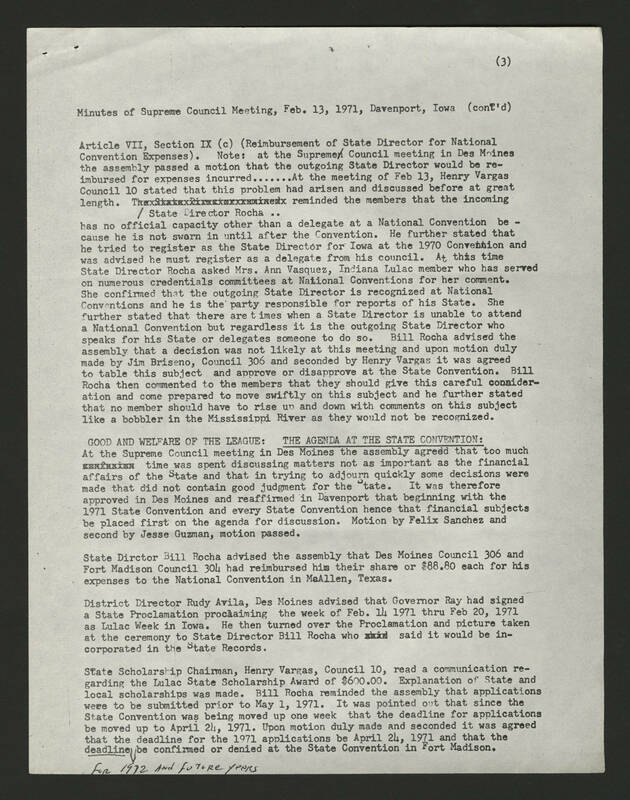 Bill Rocha then commented to the members that they should give this careful consideration and come prepared to move swiftly on this subject and he further stated that no member should have to rise up and down with comments on this subject like a bobbler in the Mississippi River as they would not be recognized. GOOD AND WELFARE OF THE LEAGUE: THE AGENDA AT THE STATE CONVENTION: At the Supreme Council meeting in Des Moines the assembly agreed that too much time was spent discussing matters not as important as the financial affairs of the State and that in trying to adjourn quickly some decisions were made that did not contain good judgment for the State. It was therefore approved in Des Moines and reaffirmed in Davenport that beginning with the 1971 State Convention and every State Convention hence that financial subjects be placed first on the agenda for discussion. Motion by Felix Sanchez and second by Jesse Guzman, motion passed. State Dirctor Bill Rocha advised the assembly that Des Moines Council 306 and Fort Madison Council 304 had reimbursed his their share or $88.80 each for his expenses to the National Convention in McAllen, Texas. District Director Rudy Avila, Des Moines advised that Governor Ray had signed a State Proclamation proclaiming the week of Feb. 14 1971 thru Feb 20, 1971 as Lulac Week in Iowa. He then turned over the Proclamation and picture taken at the ceremony to State Director Bill Rocha who said it would be incorporated in the State Records. State Scholarship Chairman, Henry Vargas, Council 10, read a communication regarding the Lulac State Scholarship Award of $600.00. Explanation of State and local scholarships was made. Bill Rocha reminded the assembly that applications were to be submitted prior to May 1, 1971. It was pointed out that since the State Convention was being moved up one week that the deadline for applications be moved up to April 24, 1971. Upon motion duly made and seconded it was agreed that the deadline for the 1971 applications be April 24, 1971 and that the deadline for 1972 and future years be confirmed or denied at the State Convention in Fort Madison.